2. 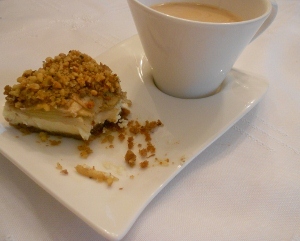 To make crust, combine graham cracker crumbs, sugar, cinnamon, butter, and walnuts. 3. 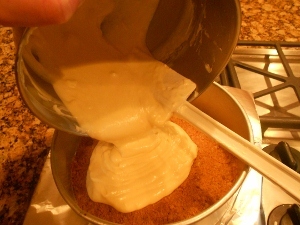 Press mixture into the bottom of a 9-inch springform pan. 4. 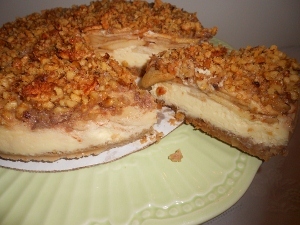 To make filling, with an electric mixer set on medium speed, combine cream cheese and 1/2 cup sugar, mixing until creamy. 5. Add eggs, one at a time, mixing will after each addition. 6. Blend in vanilla and pour filling into crust. Set aside. 7. Toss apple slices with 1/3 cup sugar and cinnamon. 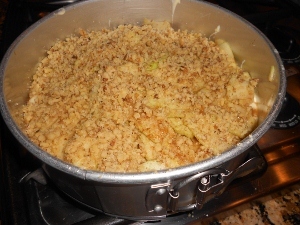 Here you have an option to leave the apples uncooked, in which case, they will be a little crunchy after baking, or you can lightly cook the mixture for 20-30 minutes on a low flame until the apples are softish and nicely carameled. 8. 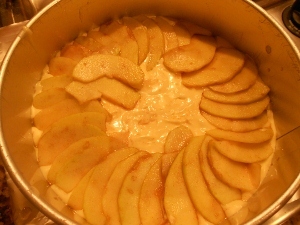 Spoon coated apple slices over filling and then sprinkle with walnuts. 9. Bake for approx 1 1/2 hours. 10. Remove pan from oven, and let cool for about 2 hours. 11. Chill in the refrigerator for 4-6 hours.